You may think that your home is a safe and secure environment, but the arrival of a tiny new member of the family is guaranteed to make you look at your home in a whole new light. Children are naturally curious and love nothing more than finding new places to explore and things to play with. Unfortunately, these aren’t always suitable for little hands, which is where the risk of accidents, falls and injuries can occur. 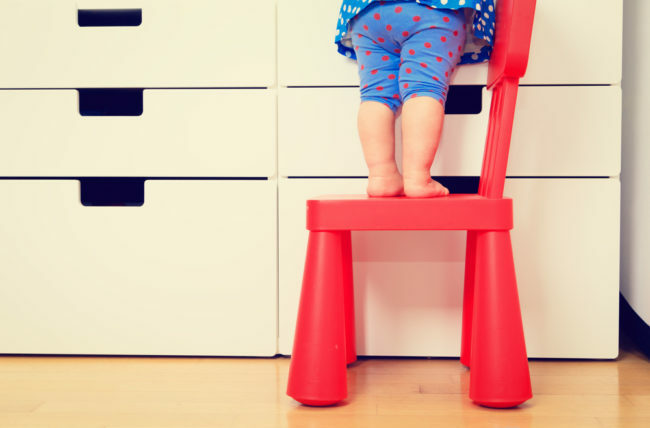 Of course, it is impossible to ever fully child-proof your home, but there are still many steps you can take to ensure your home is as safe as possible for your little one. After all, the last thing you want is a crying baby or an impromptu trip to the hospital, so for the safety and health of your child, you should always work to pre-empt any possible issues and ensure their home environment is as secure as it can realistically be. Bearing this in mind, it doesn’t need to involve a massive undertaking or a full-on home improvement project. With a few tweaks and adjustments, most homes will soon be ready for the arrival of a new member of the family, allowing you to focus on welcoming your new baby into the world! Doors and windows provide a sense of intrigue to youngsters. Although toddlers may not be able to reach door handles or window catches, they can still end up getting themselves into mischief if you aren’t careful. If your windows open wide enough to allow a curious child to climb through, it is well worth fitting locks to prevent any accidents. Similarly, it’s sensible to keep any large items of furniture like tables or chairs away from windows, reducing the risk of children climbing up to access windows. Another tip is to ensure curtains and blinds are out of the reach of children where possible; this is especially important with blind cords. Hinge protectors can also be a good investment as they can reduce the risk of tiny fingers getting pinched or caught in the hinges. The most common cause of all accidents in the home, falls are all part and parcel of a child’s life. As soon as your little one starts learning to crawl and beginning to walk, you need to be on constant guard to ensure they don’t get into difficulties or hurt themselves falling while trying to move around. Carpets and cushioned floor coverings are one of the best ways to reduce injuries from falling. If you have a wood or hard floor, it may be worth investing in non-slip rugs to ease the impact of falls. Another alternative you may not have thought about is to include artificial grass within your home. This material is perfect for playrooms and kid’s bedrooms thanks to its quirky look, soft feel and special cushioned under layer, helping children to stay safe while adding a unique approach to your home’s décor. Artificial grass installation is also easy, making it an ideal quick solution to the issue. There are always going to be hazards of some sort in the home, but it is your job to ensure any risk is reduced as much as possible. Use your common sense and try to view the house from a child’s point of view, as this may help you to identify potential hazards you might not have previously noticed. Make sure to store any dangerous or sharp items safely out of reach of children – secure drawers or cupboards are always best where possible. As your children grow, it may be worth putting the most dangerous items out of sight and reach into a cupboard and fitting it with a lock to ensure your peace of mind. This should also be done with any medication or first aid supplies. Of course, with this in mind, the best way to help your children stay safe is by ensuring you are always on hand to help prevent any incidents. Whether it is bedtime, playtime, mealtime or bath time, your supervision and a watchful eye is the best tool you have when it comes to safety and security. Child safety is vital but it doesn’t have to be complicated; get started on your home improvements today and transform your home into a more secure environment for your children. If you’re looking for the best Charlotte web design click here for the top web designers around.